Home >> Generated from JAN's SOAR Information System on 4/21/2019 12:09:25 AM. 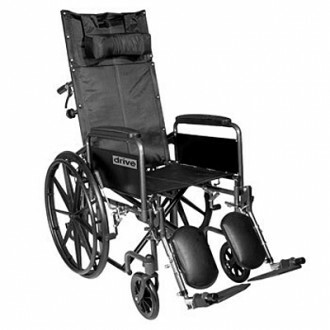 The Drive Silver Sport Reclining Wheelchair is a full recliner with a new state-of-the-art hydraulic reclining mechanism that allows for infinite adjustments up to 180 degrees. Once in the reclining position the padded arms have support extensions to allow for greater comfort. The Silver Sport also has composite Mag-style wheels that are lightweight and maintenance free and standard swing-away elevating legrests.